Sliding barn doors can make a bit of noise as the metal rollers glide along the metal track, which adds to the rustic charm. However, for places where silence is golden (like a baby’s bedroom or a library), we offer silent rollers. 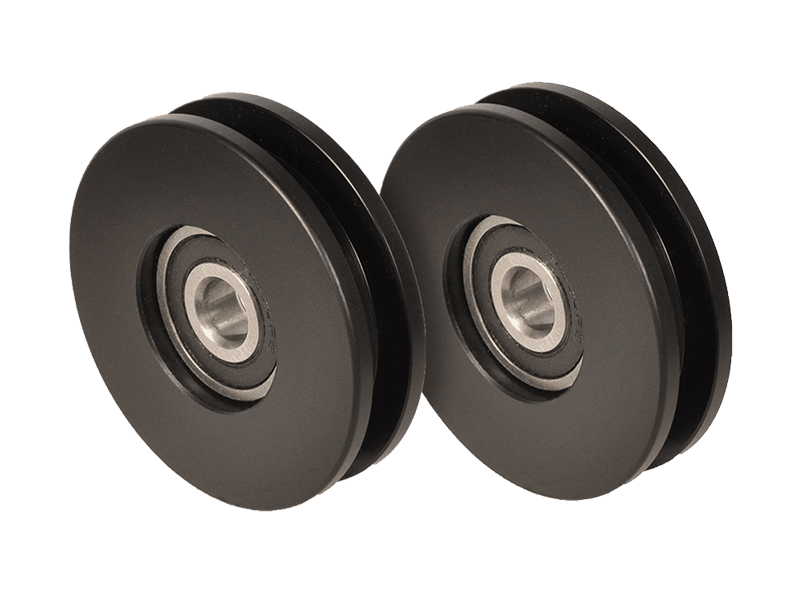 Instead of metal, these rollers are made with Dupont™ Delrin® acetal resin, a high-tech polymer developed for its stiffness, strength and its suitability for precision manufacturing. We use Delrin rollers because they are resistant to warping or getting flat spots, unlike some nylon rollers. Silent rollers are available in black, only, and can be substituted into any of our Standard Series or Stainless Steel Series barn door hardware sets or bypass sets. (Silent rollers are standard equipment on our MP Series and Shutter Series products.) Silent rollers must be installed at our factory, so please ask your local retail dealer to place a special order for you. IMPORTANT: We do not recommend using silent rollers with doors weighing more than 200 pounds.